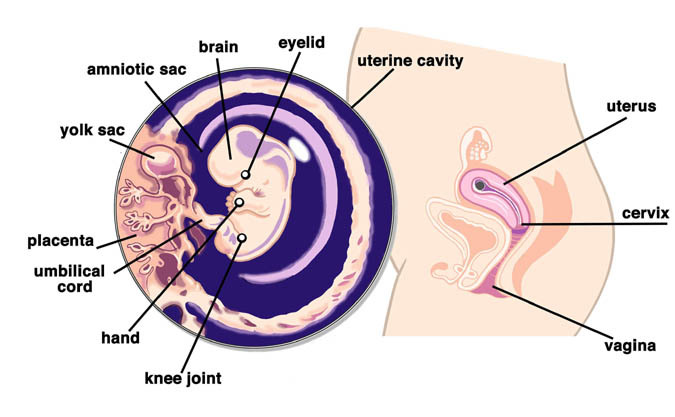 At last we can officially start calling your unborn child a foetus, rather than an embryo! This is because the embryonic tail has all but disappeared, and all the baby's major organs are in place and are operational. The mouth, lips and nostrils are now becoming visible, and the limb buds are growing, making them look more recognisable as legs and arms. You won't be able to feel anything yet, but by now the baby is making lots of spontaneous and jerky movements of its tiny little limb buds. The baby is now about 1.25cm long, and getting bigger every day. We all hear lots about morning sickness, fatigue and feeling emotional, but what about some of the less discussed symptoms of pregnancy? Have you noticed a change to your hair at all? It may or may not be a positive one as some women are delighted to find their hair more healthy looking, while lots of others complain that it goes limp or greasy. Either way, due to hormones you will probably be growing more hair. Lots of women consider fuller, thicker hair a bonus. However, the additional hair growth doesn't restrict itself to your head; you are most likely going to find that the rest of your bodily hair is growing slightly faster than normal too! Pregnancy is not a good time to embark on a set of electrolysis or bleaching treatments (seek advice first if this is what you really want to do), but you are free to continue with the razor or the wax as you please. Just remember that your skin can be a little more sensitive during pregnancy so always let a beautician know that you are pregnant. If you're planning any changes to your hair colour then seek advice from your hairdresser and midwife first. There is no conclusive research to show that the tiny amount of chemicals absorbed through the scalp will be harmful to the baby, but some experts do still advise against it. You will probably still be fitting into your jeans, but you may find that your bra is now slightly too tight as your breasts can do a lot of growing during the first trimester. Make sure that you get yourself measured and wear a well-fitting bra. Some experts advise against wearing a bra with an underwire, as it is thought that the wire may obstruct the growth and shape changes that are taking place in your breasts. It has also been suggested that the wires could impede the blood flow or hinder the milk duct system which is already developing. Whether you decide to go for the underwire or not (some women find that they cannot get the support they want without one) then make sure that the bra fits you properly and that you feel supported at all times. Women with larger breasts may find that wearing a bra at night makes sleep more comfortable. Whether you like it or not, your breasts are likely to continue growing, so rather than rushing out and buying five new bras today, perhaps it would be best to just get one or two and then get yourself measured again for new ones in a month or two. Page generated in 1.3108 seconds.